As you know, rose hips are the fruit of the rose plant that contain the seeds. 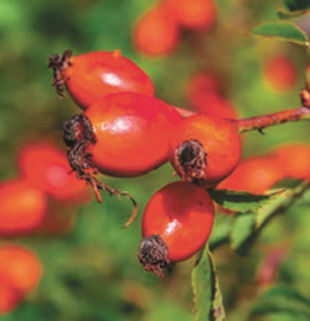 I recommend that you leave the rose hips on the plants for the winter. They are pretty focal points to look at all winter long and are a wonderful source of food for the birds during the cold weather when it's hard for them to find food. In the spring, cut off what's left of the rose hips when you are doing your pruning and thinning (before the roses bloom). During the growing season, cut off the rose hips after blooming so the plant puts its energy into making flowers and not fruit. After September 1, I usually do not cut off the spent flowers of roses so that the hips will grow heading into winter. Thank you for your question.